The exciting game of Mah Jong has existed in one form or another for ages. It is interesting, fun, and stimulates the cognitive processes of the brain. Throughout the years, it has stood the test of time, and its longevity has made it popular again today, as the game has enjoyed a new resurgence with people of all ages. One of the most intriguing and stimulating aspects of Mah Jong is that it is played with other people, engendering a vibrant, social atmosphere not often observed in society today. Although there exist online versions, there is something very beneficial feeling when one holds the tiles in one's hands and moves them around. That tangible quality of Mah Jong engages one physically, mentally, and again, socially. Those who play it heap effusive praise upon the game. Studies demonstrate that by engaging the cognitive abilities of the brain, the mind remains flexible and sharp, and Mah Jong elicits a beneficial neural response when played. Some naysayers posit that Mah Jong is too complicated to learn, and they shy away from playing it for this reason. It is evident that there exist different levels of complexity to the game, but one can learn to play relatively easily and the payoff is multifaceted. Once one learns it is difficult, even inconceivable for some to stop playing! The game of Mah Jong entered the world in China. There is some debate as to its inception, origin, and creator(s). It is often said that the famous philosopher Confucius started the game, but that has not been proven. However it began, it was being played in China in the mid to late 1800s. It was introduced to the United States in the 1920s. Mah Jong, as stated before, is a very tactile game. There are 136 tiles that are based off of different Chinese symbols and characters, although some sets go up to 144 tiles. The game is usually played with four players, although there are some variations of the game from different countries that have a different number of players. 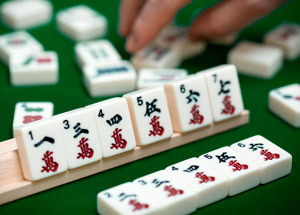 Some computer versions of the game have a setup where there is only one player who plays against the computer, but generally speaking four players is the number to use when playing Mah Jong. In order to play Mah Jong, a combination of skill and luck is required. This adds an element of excitement and unpredictably to the game. In addition to these, one must employ strategy and calculation in order to plan moves and react to what the other players are doing. At the commencement of play, each player is dealt 13 tiles. One continues drawing and then discarding unneeded tiles until one completes what is referred to as a drawn hand. This uses the fourteenth tile and at the end the same is used to form a pair (head) and four groups which is called a meld. One can draw a tile or in some cases it is okay to "steal" it from another player. There are many different interpretations of the rules of Mah Jong. Rules in one place may differ greatly from rules in another location. Many groups of people who play the game have their own variation of the rules. So it is not set in stone for every game of Mah Jong around the world what exactly the rules are. The tiles themselves are divided into three categories: Simple Suits, Honours & Flowers. There are three different suits, or simple suits, which are numbered starting at one and ending with nine. Following this are the Honour Suits. There are only two of these suits, called the Winds and the Dragons. The Wind tiles have the four different directions of the wind - North, South, East & West. The Dragons have three colours - red, white, and green. There are a total of four tiles in each of the Honours. There are eight additional tiles referred to as Bonus Tiles. You have four Seasons and four Flowers. Each of these has four different kinds shown on the tiles. The four seasons are - Spring, Summer, Autumn & Winter. The Flowers are - Plum Blossom, Orchid, Chrysanthemum & Bamboo.